Just reducded $2,000,000 for quick sale! This exclusive boutique hotel is located in the Costa Ballena area of Costa Rica, which is steadily becoming the hottest destination in the country. Surrounded by untouched tropical jungle, with views of the Pacific Ocean, the hotel is intimate and inviting. 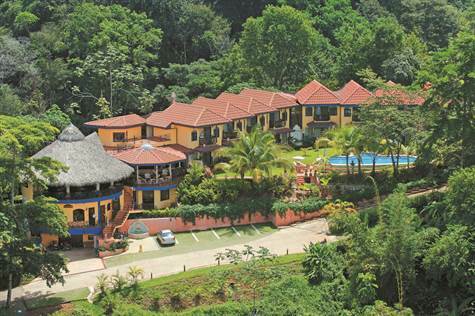 The built in 2005, the luxury design with touches of colonial and native Costa Rican influences allow this hotel to stand out from the crowd. The bi-level second floor holds the restaurant and the lobby, which includes a 700 sq. ft. lounge and souvenir shop. The attention to detail is displayed in the decor; noteworthy is the ceiling dome of the restaurant with optic fiber star constellation of the local sky on August 8th, 2005. The restaurant is the central gathering area and is designed to serve homage to local ancestors. Its architectural design was based on the traditional ceremonial dwelling of the Boruca native tribe of Costa Rica, featuring views of the ocean below. The restaurant area measures 1,338 sq. ft. The popular Spa offers its guests and locals a wide range of beauty and wellness treatments in the soothing ambiance of natural splendor. It is currently known area wide for its state of the art treatments, such as cellular stimulating and accelerating for rejuvenation. The hair salon is located next to the Spa. The Spa itself has a massage room, shower and toilets as well as a large pedestal tub, to optimize relaxation. The hotel holds 25 guest rooms. The 16 deluxe rooms are each 307 sq. ft. and overlook the swimming pool with some ocean view. Each deluxe room is richly decorated with colonial influences, includes an air condition unit and two ceiling fans and private bathroom with tub. The 7 superior jungle rooms are decorated in Caribbean style with private balconies looking into the lively rainforest. Guests can enjoy the local wild life, birds and butterflies from the privacy of their room. Each superior room has an air conditioning unit and ceiling fan, as well as private bathroom with shower. A path from the main lobby area leads guests to the 1,137 sq. ft. swimming pool, centrally located for easy enjoyment. Here guest can enjoy the cool ocean breezes and views during the day. The grounds also hold a plunge pool in the superior room section of the hotel. There is a 2 bedroom house on the property with pool and deck, which can serve as an owners or caretaker’s quarters. This popular boutique hotel offers an abundance due to its location, design and reputation. Invest in one of the hottest designations in the world today!